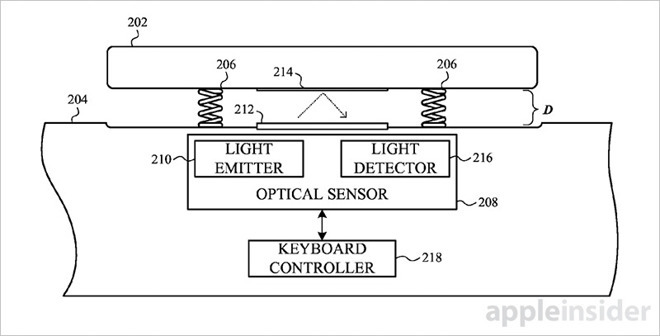 An Apple invention detailed in a patent application published Thursday describes a method of decoupling a keyboard's mechanical feel from its electrical functionality using proximity sensors, which allows greater customize key feedback. Contemporary keyboards rely on electromechanical actuators to transmit key press signals to a central processing unit. The components usually incorporate multiple structures under a single keycap, for example a key travel mechanism (butterfly or dome switch), tactile feedback structure (membrane) and electrical contacts or electrodes. Due to tight space constraints in modern keyboards, especially laptop versions, the tactile feedback component is often nested within the key travel mechanism below the electrical traces. The parts sandwich inhibits independent component modification, as a manufacturer must rework the entire system to achieve different keyboard experiences. Users, meanwhile, have divergent tastes when it comes to a tactile feedback, as some prefer a silent, low travel key press, while others like loud "clackity clack" keys with long throws. Keyboard "feel" is hotly debated when Apple launches a new MacBook, for example. To better cater to individual user preferences, Apple proposes a method for decoupling the mechanical and tactile functionality of a key from its electrical functionality. Specifically, the document replaces electrical contacts and traces with non-contact proximity sensors, while travel mechanism and feedback structures remain largely intact. In most embodiments, Apple's key design features a light emitter aimed at the reflective bottom surface of a keycap. An accompanying light detector, or central detector connected to a light guide, generates an electrical signal in response to the received light. When processed by a keyboard controller, the signals can be used to estimate force, velocity and distance metrics to accurately determine when a key is pressed. The resulting data set is much wider than simple "open or closed" circuit constraints seen on traditional keyboards. By applying pre-determined thresholds to incoming signals, Apple's invention can in some cases detect errant key presses and support force-sensitive input applications. Other embodiments include dynamic threshold adjustments on a per-key and per-application basis, allowing users to set one input level for word processing and another for gaming. As for tactile feedback, Apple's invention includes contingencies for installing structures formed from a materials capable of elastic deformation such as an electroactive polymer or shape-memory metal. In some embodiments, users can adjust the feel of these components on the fly. Apple's document goes on to describe alternative embodiments and a detailed rundown of how the optical sensor mechanism functions. The company also mentions manufacturing benefits of deploying a decoupled keyboard system. It is unclear whether Apple intends to implement its customizable keyboard in a future Mac product. The company is, however, expected to announce new Mac hardware at a special event next week. Apple's patent application for a keyboard with decoupled electrical and mechanical functionality was first filed for in April 2015 and credits Chang Zhang, Dayu Qu, Ray L. Chang and John S. Camp as its inventors.